Ongoing development of CF7 Skins is made possible by sales of renewable annual licenses of our Add-ons. 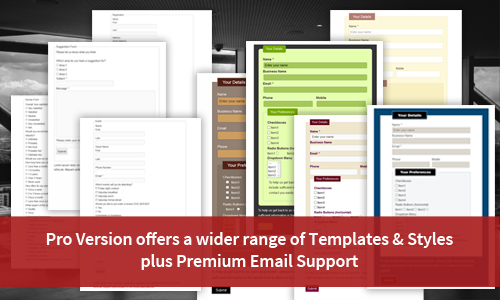 CF7 Skins Pro offers a wider range of Templates & Styles for commonly used forms. Premium Email Support is provided to deal with your questions and problems. Our range of Add-ons brings the functionality available in other premium WordPress form plugins directly within Contact Form 7. Premium Email Support is provided to deal with your questions and problems. If you purchase a CF7 Skins Add-on, it comes with a whole year of free updates and support. To make support as easy as possible for our users, our support system is email based. We do have a support system operating behind the scenes, to help us answer your questions, but for users it’s just simple emails answering their particular questions. Each Template acts as an easy to follow guide, which can be adapted to your particular requirements. Community based support offered by other CF7 Skin users (we visit the forum intermittently to assist with plugin bugs only). Premium Email Support is provided to deal with CF7 Skins Pro users questions and problems.